are only a phone call away. Specializing in thermal management solutions for the industrial and telecom markets, VoltAire offers a focused product lineup built from decades of industry experience. GLP Canada distributes VoltAire heat exchangers and pressurization units for use in telecom and industrial markets. Explore featured products or contact us below to learn more. 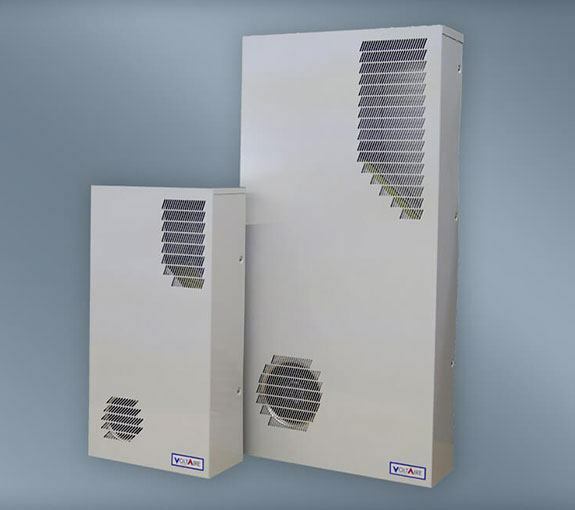 The HTX Series of heat exchangers from VoltAire Systems is designed to remove heat from cabinets with sensitive electronics or telecom equipment. 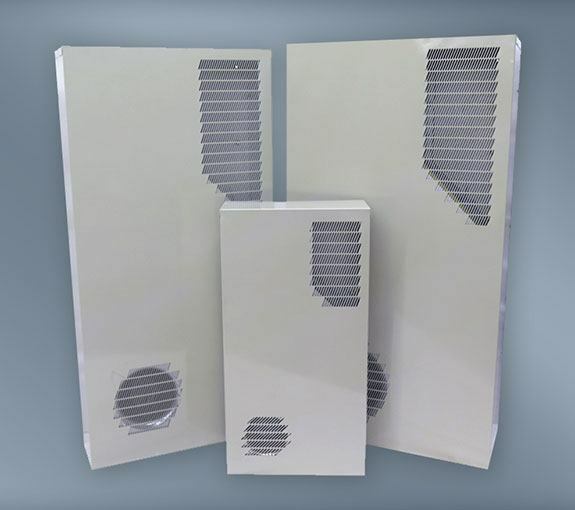 Thanks to a unique rain guard deflector, these cross-flow heat exchangers solve a longstanding issue with leaks in the telecom industry, making them suitable for exterior use. VoltAire’s HTC Counter Flow heat exchangers provide a narrower width to accommodate placement on smaller doors or equipment. They also offer a quieter design than the HTX Series, thanks to slower airflow and lower decibel axial fans. This makes them ideal for outside plant facilities in residential or light commercial areas. 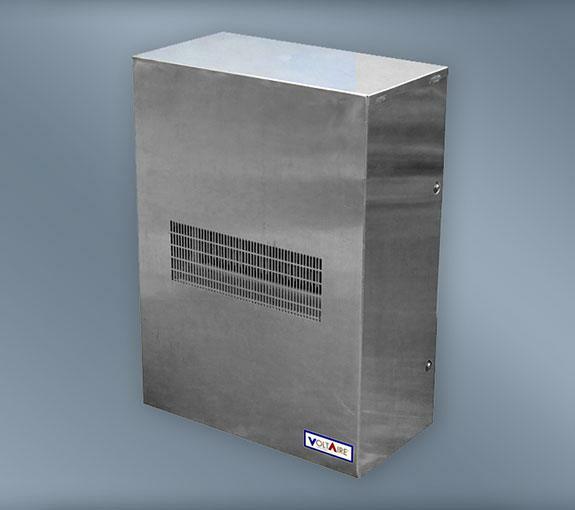 VoltAire HIX Series heat exchangers are designed for interior use in industrial applications. Their closed-loop cooling removes heat from shelters with sensitive electronics or equipment, while keeping the interior cabinet free of dust and humidity. VoltAire pressurization systems provide positive or negative pressure to a building or room. The systems automatically maintain pressure relationships with adjacent areas or ambient air with a high efficiency variable capacity fan. Air is filtered with 1″ pre-filter and 2″ final filter with MERV ratings up to 14. The pressurization controller modulates the pressurization system capacity to maintain the set point pressure, measured in inches of water column. A low pressure alarm is provided via dry contacts. 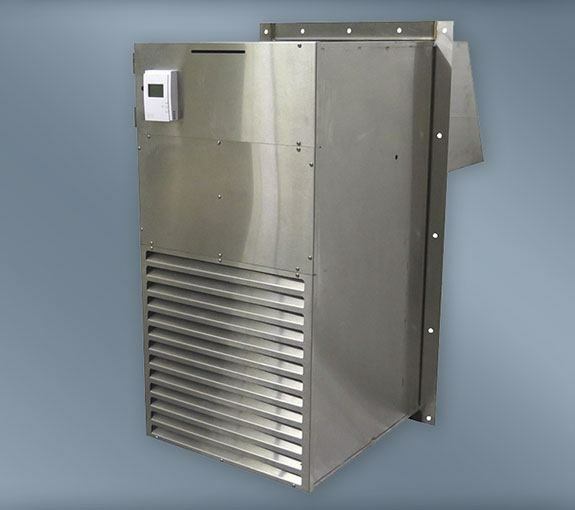 VoltAire heat exchangers are specially engineered to address the unique temperature challenges of the telecom and industrial markets. In addition to protecting valuable data and equipment, these products come with features to maximize uptime and reduce electricity and operating costs. With two Canadian warehouses and a coast-to-coast network of 560 authorized service centres, we're ready to help with all of your product, service and warranty needs. Send us an email or fill out the form below. GLP Canada provides bilingual sales, service and warranty support. For a quote or more information, contact us today.